A federal judge in Chicago has ordered immigration authorities in Illinois and five neighboring states to stop asking local law enforcement agencies to detain suspects who may be in the country illegally. The order, signed Friday by U.S. District Judge John Z. Lee, would void thousands of so-called “detainers” sent annually to state, county and municipal jail and police officials requesting that they keep suspects in custody for 48 hours after their local cases play out—giving immigration agents time to pick them up. Detainers are one of the major tools used by U.S. Immigration and Customs Enforcement (ICE) to identify individuals to deport in the interior of the country. The ruling won’t go into effect immediately; the federal government has until Thursday to notify the court if it will seek a stay pending appeal. The decision comes as immigration has become a key issue in this year’s presidential elections, with Republican candidate Donald Trump promising to build a wall along the Mexican border and condemning so-called “sanctuary” cities and counties — like Chicago and Cook — that refuse to cooperate with federal immigration authorities. 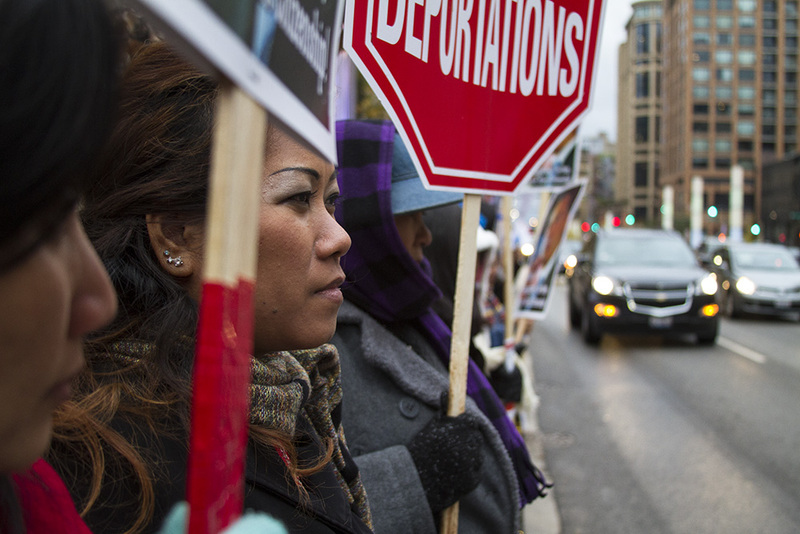 Earlier this summer immigrant rights groups lobbied Chicago’s City Council to amend an existing ordinance to further bar police officers from cooperating with ICE agents. But much of that language was stripped from the proposed amendments after city officials raised concerns about losing federal funding. On Wednesday the City Council is expected to vote for the pared-down proposals, which would prevent police officers and other city employees from using coercive or threatening language against immigrants. A spokeswoman for the ICE field office in Chicago said the agency is reviewing the ruling, which would apply to Illinois, Indiana, Kentucky, Kansas, Missouri and Wisconsin. Between fiscal year 2014 and the first two months of fiscal year 2016, ICE issued 9,413 detainers in those six states, according to data from the Transactional Records Access Clearinghouse (TRAC) at Syracuse University. The federal order does not address the constitutionality of ICE detainers. Instead in his opinion Lee wrote that the immigration agency overreached its authority by issuing detainers rather than seeking judicial warrants or showing that individuals were likely to escape before a warrant could be obtained. The class-action case was filed by Jose Jimenez Moreno, a U.S. citizen who was in a Winnebago County, Ill., jail when ICE agents issued an immigration detainer against him in 2011, and by Maria Jose Lopez, a lawful permanent resident who was serving a federal sentence in Florida that same year when a detainer was placed on her. In recent years, ICE has drastically reduced its use of detainers — from nearly 30,000 per month in 2010 to fewer than 10,000 per month last fall, according to TRAC data — in order to prioritize undocumented immigrants who have committed serious crimes. In the 2015 fiscal year, ICE issued more than 95,000 detainers to local law enforcement agencies. In nearly half of those cases, the detainers pertained to individuals who hadn’t been convicted of any crime. Data obtained through public records requests by National Public Radio and shared with The Chicago Reporter show that ICE issued more detainer requests to Cook County Jail in 2014 than any other law enforcement agency in the state. Cook County officials don’t honor these requests, however, unless there is a warrant. The Statesville Correctional Center, a state prison in Crest Hill, Ill., receives the second-highest number of detainer requests, followed by the jails in DuPage, Kane, Lake and McHenry counties. The judge just made enforcing U.S Immigration laws harder to enforce and allowing criminal Illegal Aliens to roam Chicago victimizing more citizens. People wondering why Chicago has more violence should take note Chicago has 2 Million Illegal Immigrants and the drug cartel has set up shop leading to more gangs and more crimes. Outrageous decisions like Lee’s, greatly reducing the ability to enforce our duly enacted laws, and are driving more and more voters to vote for Trump. Radical liberals of Lee’s ilk not only betray our laws, but our entire nation. They fail to recognize the depth and breadth of grass roots Americans’ anger and resentment over having foreign interests dictate our policies to our detriment, as well as the negative impact on our pockets, being made to pay for the education of minor illegal aliens and the children of illegal aliens, their health care, and a host of welfare and other public benefits. We despise having our laws and the fundamental principles of this nation mocked by illegal aliens and their facilitators, demanding that we change our laws to suit them, also to our detriment, having to watch while they screech in the streets and hide behind their children. How revolting! Illegal presence is a mockery of our laws, and our principles, and in particular, a repudiation of Rule of Law and our national sovereignty, and our integrity as a nation. No wonder millions of voters will be electing Trump, despite his blatant flaws. He is far less flawed than Hillary and is willing to rectify the atrocity of welcoming illegal aliens, tolerating their criminal acts, and sticking the taxpayers with huge bills to support them. I have to protect myself many of time from the illegal immgration and one who are citizen and who hold the green card the visa. They need no more pass and we should suit and federal judge who betrayed us American people. We can do it. It our city and we need to defeat our enemies.